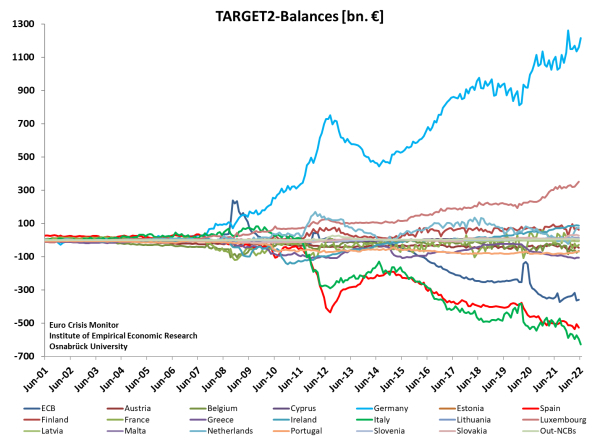 The Institute of Empirical Economic Research at Osnabrück University has been tracking TARGET2 balances from October 2011 to September 2015, nearly on a daily basis. In our view, it was a key indicator of Europe's balance of payments crisis and continues to be a biomarker of financial stability in the Euro area. As of September, 2015, the ECB is providing these numbers in a common database. Based on data of the national central banks of the Euro Area. A complete data appendix can be found in "The role of creditor seniority in Europe's sovereign debt crisis", Sven Steinkamp & Frank Westermann, Economic Policy, 2014. Andreas Steiner, Sven Steinkamp & Frank Westermann, CESifo Working Paper #6753, 11/2017. The Euro Area’s Common Pool Problem Revisited: Has the Single Supervisory Mechanism Ameliorated Forbearance and Evergreening? Aaron Tornell, Sven Steinkamp & Frank Westermann, CESifo Working Paper #6670, 09/2017. Sven Steinkamp & Frank Westermann, International Journal of Finance and Economics, 2017. Sven Steinkamp & Frank Westermann, Economic Policy, 2014. Valeriya Dinger, Sven Steinkamp & Frank Westermann, Open Economies Review, 2014. Frank Westermann, Economic Policy, 2014.